Although it was unexpected, New Summit Academy Costa Rica was born on January 1, 2005, through a collaborative effort between the founders and eleven families and their sons. 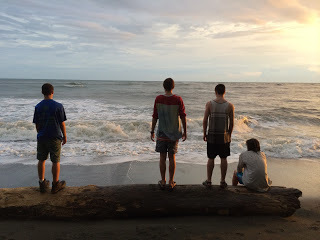 Not satisfied with the options available, these families asked our founding team to support their sons in finishing high school and growing into self-sufficient, resilient young men. The parents donated the start up funds, and these students arrived to a humble "campus" on a local mango farm and helped paint their cabins, build their desks, and write the first NSA handbook. This "golden group" of students taught us more than we taught them, but we helped them get through high school nonetheless. Together, we taught classes, played music, cooked meals, created art, rafted rivers, learned Spanish, climbed mountains, embarked on Aventuras, and NSA began to grow up. Our family continued to grow over the years. We purchased a property in a nearby neighborhood, spent almost 2 years building the new campus, and set up shop in our beautiful new home in September 2012. To this day, the four founders continue to work full time on site as directors of their respective departments. We've grown from our original 7 "employees" to over 60. We opened a transition house in 2010, the young adult gap community opened in 2012, and we continue to grow organically and naturally. The trust and belief of the original "golden group" in our mission to provide a unique, nurturing, integrated, holistic environment for the development of our selves, our families, our communities, and our futures, continues to guide NSA today. It might have been unplanned, but like many of life's greatest treasures, we wouldn't trade a single minute! New Summit Academy nurtures and empowers students toward healthier lifestyles through processing experiences and solving problems to become more relationship-based, goal-driven, resourceful global citizens. ​Although these three departments own and implement different activities and experiences, we all work collaboratively to integrate our resources and further the development of physical, emotional, psychological, cognitive, social, and spiritual (connectedness) objectives. Intentional integration and balance is the key to our holistic approach. Humanistic Paradigm: New Summit Academy approaches development and achievement from a humanistic paradigm, meeting each student where he is and nurturing, supporting, and empowering his most productive path in developing a growth mindset for life-long learning. 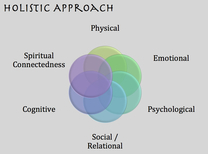 Holistic Individualization: We recognize each individual's unique strengths and challenges and implement a holistic program to take advantage of strengths while overcoming challenges and building resilience. Integrated Skill Building: We intentionally integrate skill building into each aspect of our holistic program in order to develop valued 21st Century skills such as innovative problem solving, executive functioning, self-management, communication, collaboration, leadership and teamwork, interdependence, and global citizenship. Supportive Immersion: The supportive immersion experiences that we provide at NSA include academics, personal growth, student life, and experiential education. Each experience - whether it be a class, a therapeutic group, a community chore, or a cultural immersion experience - directly supports our mission and furthers the development of the whole person. We help students immerse themselves in their inner and outer worlds with our nurturing and empowering support. The high standard of intentional integration of all of these life changing experiences is what makes New Summit Academy unique, innovative, and like no other boarding school! Since the day New Summit Academy was founded, we have been striving to support young men to develop healthier senses of self, to be productive and collaborative community members, and to harness motivation and passion for a bright, productive future as global citizens. We love our jobs and are proud of our unique community that constantly grows along with its students and staff. There is nothing more rewarding to us than witnessing the daily insights, achievements, and maturation of every member of our community.